Duck! We're heading for three big family reunion celebration months. During this season there will be many special events whipping by. Watch out for low flying objects and falling graduation caps. 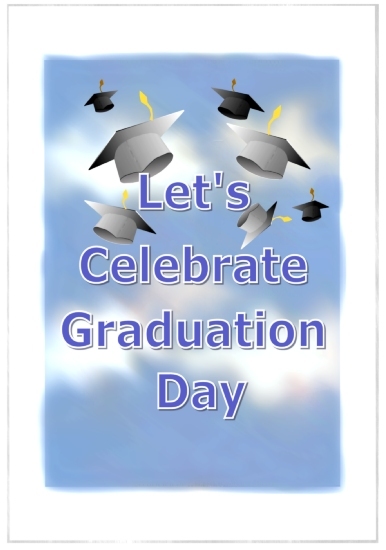 Here comes all those ceremonies and parties from pre-k to college to weddings. Who knows, you may even be in a wedding or two. What's That? A mob of women heading this way. Smack! What now? A bouquet just landed on my head? Quick, throw it back and run. Looks like many of you will be celebrating Father's Day. And speaking of fathers, are there any sports fanatics in your family? Heads up... it's coming in fast. Moving like a missile at twelve o'clock... Slam! Ouch! That's gotta hurt. Awe! That's gonna leave a mark. Is there no mercy for the family reunion planner during the finale weeks of sports season. Answer. None, Nada, Zip, Zero Zilch! That said it's time to wrap up your family reunion planning and get ahead of the game. Ball game that is. Have you put off reunion tasks for later? That's understandable considering all that you have to do. But guess what? Now is later. Did you at least get your t-shirts ordered? Remember LESS is MORE. The LESS you did then, the MORE you'll have to do now. If your t-shirts have not been ordered and your reunion is late June or early July, don't delay another day. Order your t-shirts now. That's right. Go to the t-shirt design website and preview and order coloful predesigned family reunion tees so you don't have to waste precious time trying to figure out how to draw a stick man and a tree. Here's a quick link to one of the top t-shirt design apps online. http://www.zazzle.com/zzibcnet. Once you choose your design just add "Year", "Surname" and "Reunion" and you're done. Now let's move on. Planning a family reunion is much like planning a voyage to a remote destination full of wonder, surprise and rewarding treasures. Yes I am getting to something here... Before you embark on your journey you have to get directions, then chart your course and finally, follow a trusted guide. Finding a trusted guide is what Fimark's Family Reunion Planner has been all about these past 10 years. Have you heard about the new Family Reunion Planner Social? I know you were looking for it's release in the Fall. Then came the Spring. Well, it's Spring now and the new family reunion social web application preview is out! Here's what I can tell you about it. It's designed to work with your laptop or desktop and is optimized for Chrome and Firefox browsers. The web app has over 15 distinct features not found on previous versions of the reunion event planning center. As a matter of fact it seems you can plan many different social events using this one web application. Once one event has passed just move on to planning the next event. 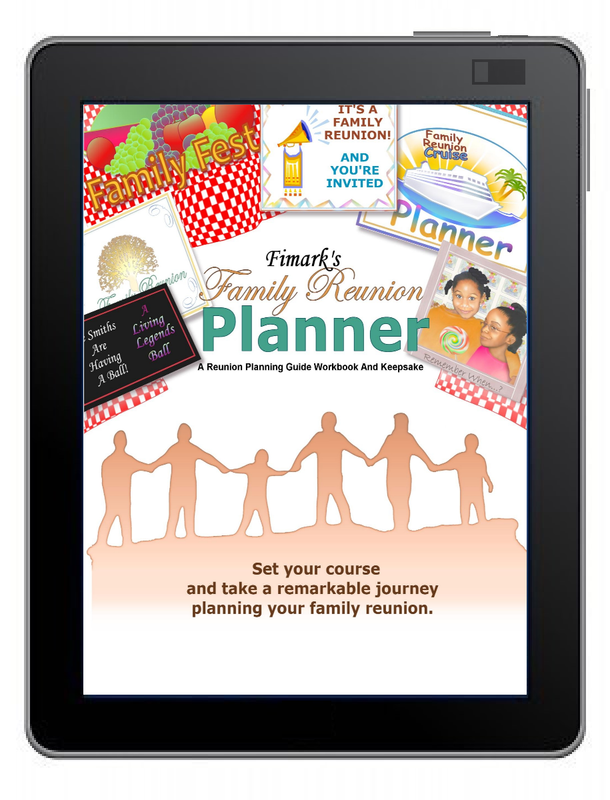 Get Fimark's Family Reunion Planner eBook in ePub format and get a preview of the new reunion planner web application soon to be released end of May 2013. Read the features, specifications and just imagine the possibilities when planning your next family reunion event. The eBook shows you how the web app syncs with your facebook page and dumps profile data into one spreadsheet-like sortable searchable data table so you can communicate with your family and friends from one data table while viewing their interests and demographics in categorized tables. Also view vital RSVP stats when planning the event. But that's just two of it's many features. Get Fimark's Family Reunion Planner ebook for details on this amazing fully social enabled reunion event planning web app. The ebook in epub format is available at Amazon.com's Kindle bookstore. Fimark's Family Reunion Planner ebook in epub format is an upgrade from the 132 page paper back book. Using the ebook you can review the Family Reunion Timeline Planner Checklist on your tablet or phone to make sure you're on track with event organization and management tasks. Take a look at the worksheets to make sure all departments are up and running smoothly. Add notes as needed to keep up with tasks. Link to web based event planning tools from your phone. Best of all the ePub eBook contains a preview of the new Family Reunion Planner Social app with new event planning techniques, tools and planning logic that can save you hordes of time, hundreds of dollars and lots of footwork planning your next reunion event.